Sanjay H. Maniar, M.D., is a cardiovascular specialist treating patients ages 18 and older. Dr. Maniar attended Rice University in Houston, Texas for undergraduate studies and earned his medical degree from the University of Alabama School of Medicine in Birmingham, Alabama. He completed his internship and residency in internal medicine at Barnes-Jewish Hospital/ Washington University School of Medicine. Afterwards, he went on to complete his cardiology fellowship at Tufts Medical Center in Boston, Massachusetts. Growing up with a father diagnosed with heart disease at a young age, Dr. Maniar understands the importance of preventing heart disease, listening to his patients, and developing a collaborative care plan to achieve the best outcomes possible. Dr. Maniar offers a complete scope of diagnostic testing, treatment and procedures. With cutting-edge training in the latest technology, Dr. Maniar sees patients for a variety of conditions including coronary artery disease, high cholesterol, high blood pressure, valvular heart disease, and congestive heart failure. He strives to provide high quality, evidence-based, compassionate care to all of his patients. In his free time, Dr. Maniar is an avid photographer and enjoys travelling with his wife. He also enjoys running, watching college football, and cooking. 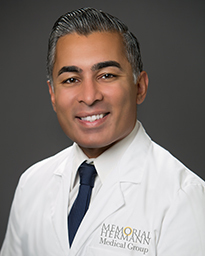 Dr. Maniar practices at Memorial Hermann Medical Group Cardiology Southwest. Sanjay H. Maniar, M.D., is a cardiovascular specialist treating patients ages 18 and older. Dr. Sanjay Maniar has a childhood memory of visiting his father in the hospital and being awestruck by the team of people who were taking care of his dad following an unexpected and urgent heart bypass surgery. Dr. Sanjay Maniar has a childhood memory of visiting his father in the hospital and being awestruck by the team of people who were taking care of his dad following an unexpected and urgent heart bypass surgery…Today, Dr. Maniar is a cardiovascular specialist with Memorial Hermann Medical Group Southwest Cardiology and Medical Director of Cardiovascular Imaging & Cardiac Rehabilitation at Memorial Hermann Southwest Hospital, dedicated to caring for his patients like his father. My anniversary is approaching. But not the one that people usually celebrate. It is not the anniversary of a walk down the aisle, a walk across a stage or some other grand rite of passage. It is the anniversary of one of the scariest days of my life. The day I suffered a stroke – at work. With help from Dr. Sanjay Maniar and Dr. Richard Smalling, I survived.